God’s chosen people, who were marched away from home into exile in Babylon, are now given permission to return home and rebuild their temple. King Cyrus even gives them back their sacred vessels stolen from the Temple 60 years earlier. The Hebrew people could hardly believe what was happening. God could even work through a Gentile King to rescue and restore his people. Isaiah shares a vision of all peoples being able to worship together in the Temple. This vision was never truly fulfilled. Non Jews were only allowed into an ‘outer courtyard’ of the Temple. What vision of welcome do you have for your Church? What limits your vision from becoming a reality? Paul continues to grieve over his own Jewish people. He hopes that disobedience will eventually meet mercy! People labelled and feeling distant from God (Gentiles) will experience union with God. Paul reminds the Church of God’s passionate desire for all the ‘unclean’ / gentiles to be made welcome in the Church. Who do you judge unclean? Some geography helps to understand the context of the Gospel reading today. 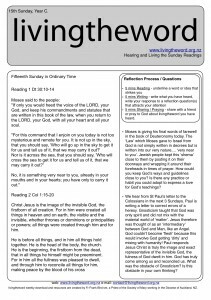 Jesus has just finished arguing with the Pharisees (Mt 15:1-20) about what is ‘clean and unclean’. He now travels into unclean ‘gentile’ territory. He moves out of the ‘Holy Land’ and into Canaanite territory. Is he trying to get rid of the Pharisees who keep following and arguing with him? Or is he trying to teach his disciples a lesson going beyond mere words of teaching? The disciples would have been hesitant to go themselves into ‘unclean’ territory. What do you think Jesus could be teaching the disciples? The Church? Without napkins at the dinner table, it was a practice that bread was broken and ones hands were cleaned with bread. Bread and food was left after dinner on the floor. House dogs were frequently able to mop up the crumbs and foodscraps after the guests had finished. This is an image used in the reading today. Is Jesus derogatory toward the woman or just revealing his first concern was ‘lost sheep of Israel’? The disciples wanted the canaanite woman sent away. She was unsettling. Was Jesus waiting for the disciples reaction to her as a way of teaching them about clean / unclean? The Gentile woman kneels before Jesus and prays ‘Lord help me’. Jesus praises and rewards her persistence and faith. To the Jewish community of the Gospel of Matthew this event would have come as a shock. Jesus entered into and found faith among the unclean gentiles. Imagine feeling or being labelled as ‘unclean’ by ‘the church’. What obstacles need to be overcome for people to meet Jesus? Are you helping or hindering? This entry was posted on Tuesday, August 9th, 2011 at 1:54 pm	and is filed under General. You can follow any responses to this entry through the RSS 2.0 feed. You can leave a response, or trackback from your own site.